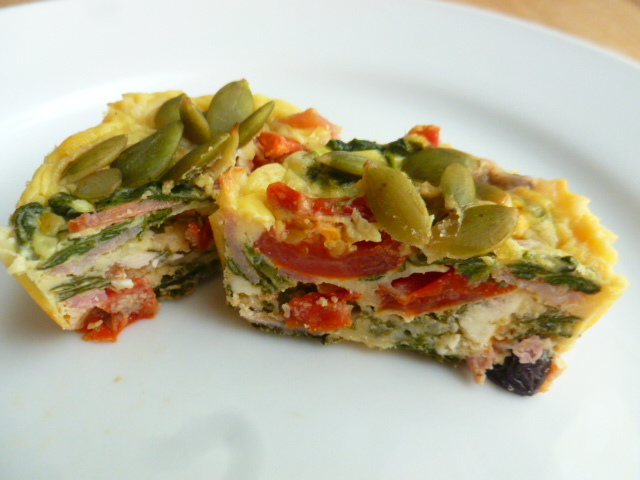 I often make starch-free breakfast egg muffins, as an easy way to serve eggs for breakfast. My usual go-to recipe is my roasted vegetables version (recipe can be found HERE). However, this time I didn’t have prepared roasted vegetables at hand, so I decided to make do with fresh vegetables. 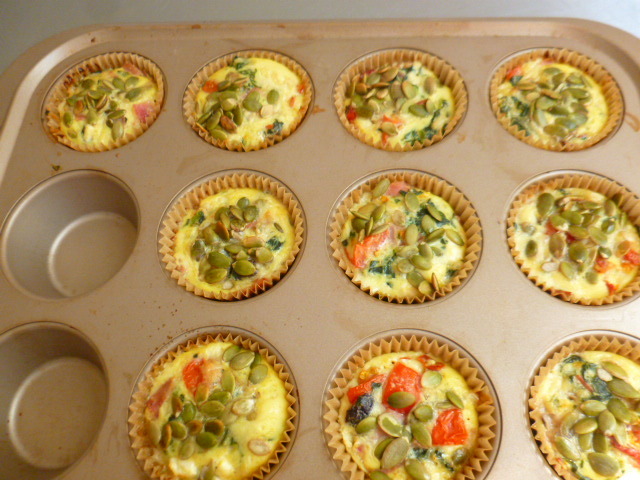 I ended up with the following colorful, flavorful and nutritious breakfast egg-muffins. 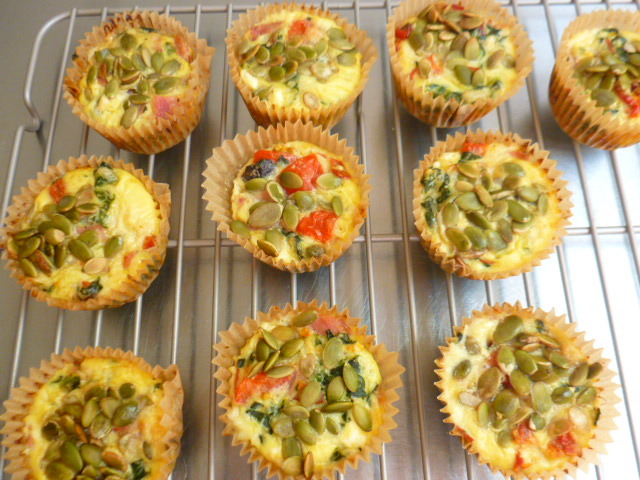 The muffins are perfect for breakfast, as they combine fresh vegetables with proteins and dairy products. To this I’ve also added chopped sun dried tomatoes and olives, and topped the mixture with raw pumpkin seeds, for some extra nutritious boost and crunchy texture. Served straight from the oven, with bagels or toasted bread on the side, and some other condiments, they make a wonderful, easy to prepare and serve breakfast or brunch. Try them, or create your own version, and enjoy. * For best results, I highly recommend not using commercial grated cheese. It contains additives that help keep the cheese separated in the bag, but at the same time change its’ texture and flavor, especially when baked. Freshly grated cheese is always better. 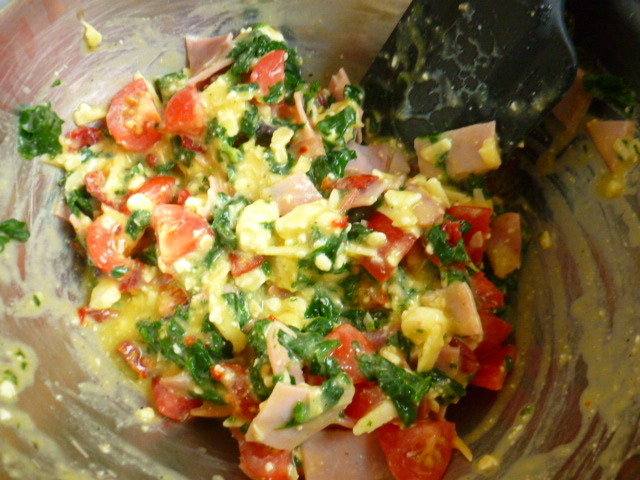 * For the ham, I used Applegate’s organic uncured Black Forest ham. Uncured deli meats are not submerged in sodium nitrates or nitrites solutions, which makes them a somewhat healthier option compared to other deli meats. 1. Mix the spinach in a pan, with ¼ cup water. Cover and place over medium-high heat. Let steam for 3-4 minutes, until the spinach is soft. Cool and squeeze out the liquids. You should end up with about ½ cup steamed spinach. 2. Preheat the oven to 360F(180C). Line a muffin tin with 10 baking paper cups. 3. In a large bowl, whisk the eggs. 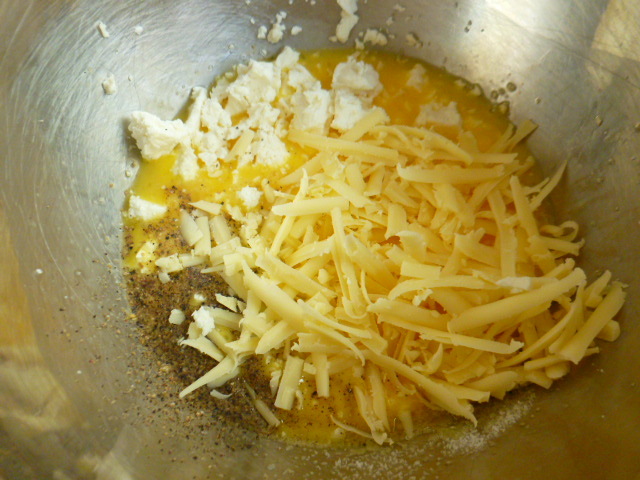 Add the salt, pepper, Mozzarella and cheddar cheese and mix well. 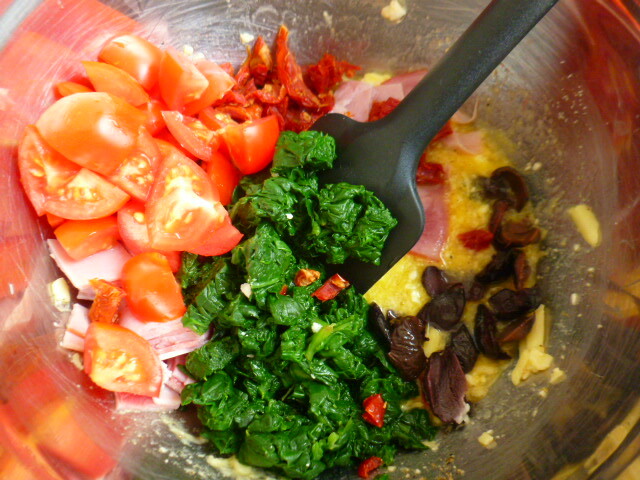 Add the steamed spinach, ham, sun dried tomatoes, olives and cherry tomatoes. Mix with a spatula and fill the baking paper cups with the mixture. 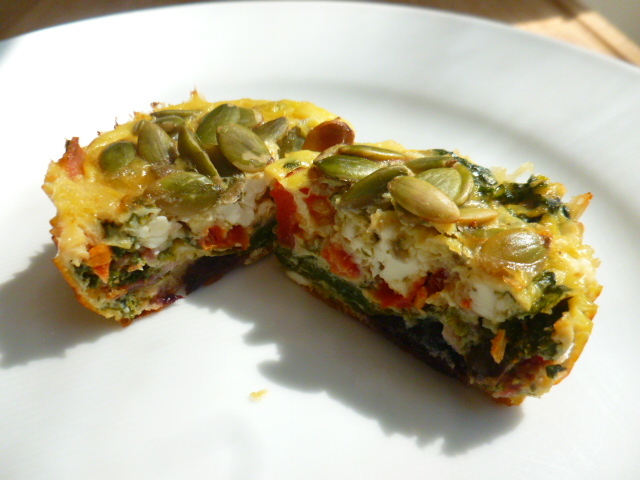 Scatter the pumpkin seeds on top. 4. Bake for 25 minutes, until the bakes are set and slightly puffed. Serve immediately. They are awesome. My tomorrows breakfast soughted. These would be perfect on a road trip for first morning’s breakfast. We tend to eat cooked five-grain cereal every morning (except Sunday), but could make an exception for these lovelies! I made something very similar once. What I can’t remember is how well they keep? Yes, there are many versions for them. They can keep for a day or two in the fridge, but unlike the ones with roasted vegetables, these don’t freeze well and are at their best when served fresh. What a great idea for breakfast!! <3 I will definitely try these and the addition of pumpkin seeds is great! Always a nice change from one’s regular breakfast offerings :) these muffins look great. 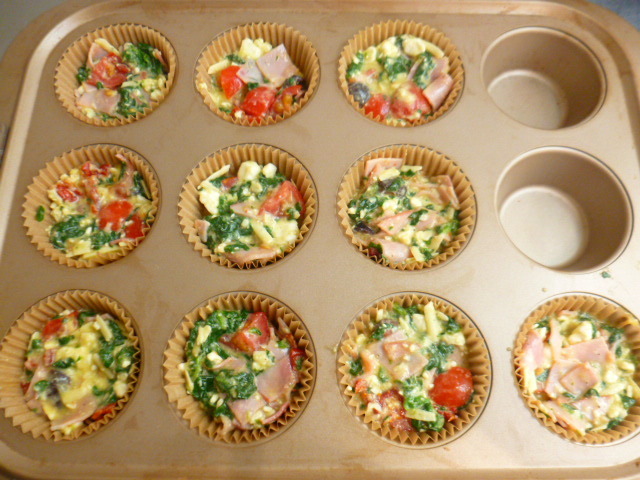 These egg muffins look so good! I love the combo of ingredients. It’s so wholesome to eat for breakfast and I could use one right NOW! 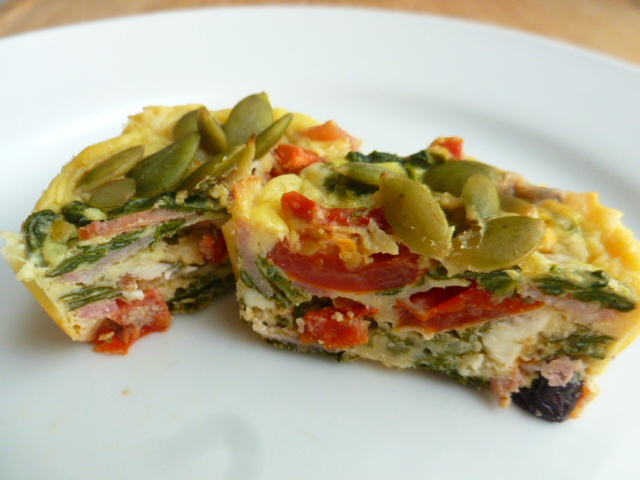 Healthy protein rich breakfast. They look delicious. 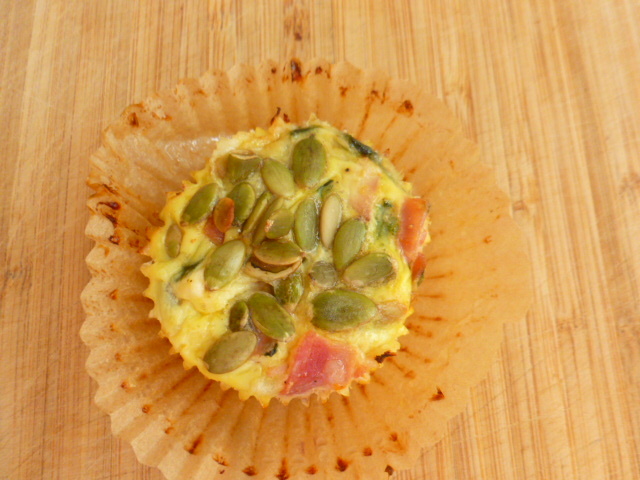 These are perfect for rushed mornings and so wonderful that they have a slight crunch from the pumpkin seeds. Cute! I make something similar, but non-dairy. Love pepitos on top! I definitely have to try making these for my family on Sunday morning–they look very tasty–and pretty too! What a tasty way to start the day, they sound great! I’m pinning. Fantastic! Love the addition of the raw pumpkin seeds! That is true. I like raw pumpkin seeds on my salads.